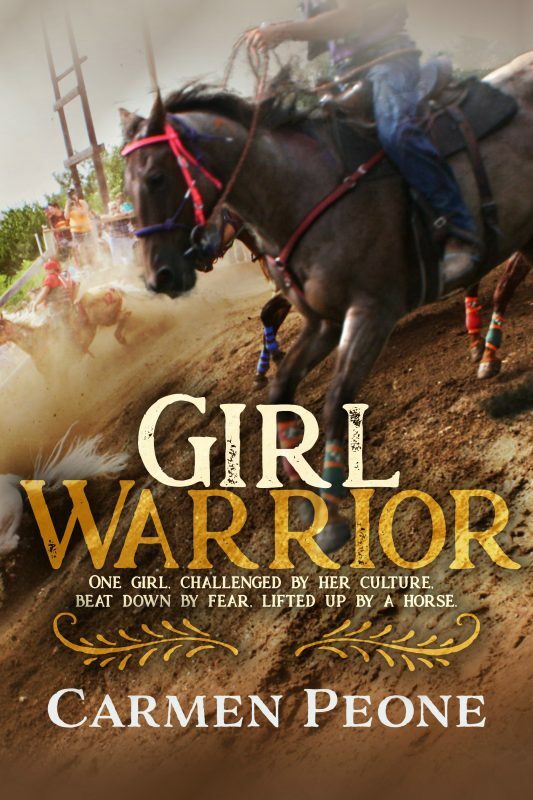 When researching Girl Warrior, I had interviewed plenty of male jockeys. I needed to find a female to interview because my main character was female. I needed a woman’s perspective but didn’t know who. Didn’t know one female jockey’s name, only they existed. So I began asking family and friends and finally found a name: Deb Condon. 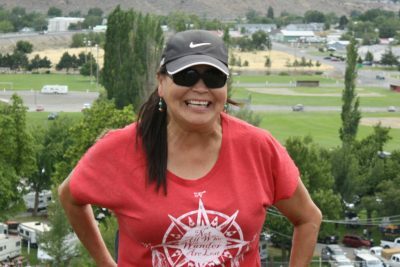 I contacted her and we set up the interview at Log Cabin Resort on the Colville Reservation for lunch. I was thrilled to finally have a live body to help me see the hill through a woman’s lens. Having ridden horses most of my life, we already had something in common. What else? I would find out soon enough. The day of the interview I had my questions ready and pen in hand. My body trembled with excitement. I’d been watching this race since I was a little girl, and now to be with a female qualifier. What an honor. You’re invited to Girl Warrior’s Release Facebook Party June 11 at 6:00 PM Pacific Time. What enticed you to enter the World Famous Suicide Race, WFSR? I was always intrigued by it, my family had participated in it for years. I grew up around it in Kartar and it was always in the back of my mind that one day I would do it. When I decided to enter, I was in great shape, had the right horse, and knew I could do it. What did racing mean to you as a Native American woman? I grew up in a rodeo family and, of course, we would race when we got a chance, we were always competitive. I just flat loved to race! How did racing make you feel? I love racing! There is nothing like becoming one with your horse and feeling every muscle, every breath, and trusting your horse to overcome the challenges in front of you. There is nothing else that compares. The rush absorbs your whole body and you can feel it all around you. Even though it (the suicide race) doesn’t last that long, it seems like forever from the crack of the gun to the crest of the hill, to entering the water, to the dike and to the arena, then you can finally breathe. Every time you are so aware of everything and everybody around you, it almost feels like slow motion, but you’re going really fast. How did you prepare for the race back in 1993? I trained my horse on a very strict regime which involved daily riding, swimming, exercising in all kinds of terrain, and a good diet, which is key. I jogged, lifted weights, jumped rope, did crunches, and anything else I thought would help me physically. Mentally, I ran that race through my mind every day from start to finish, always paying attention to my horse’s needs and making necessary changed for both of us. Where did the original race take place? The original race started in Keller a long time ago, when Indian people were gathered while salmon fishing. Racing horses have always been a tradition. The race in Keller was very treacherous, it had a lot of steep rock that they had to maneuver. I wished I could have seen that race. Did anyone give you a hard time as a female entering the WFSR? Of course, but I expected it. I had been competing in horse races in Pendleton, the local fairs and rodeos, and the rez races and was beating a lot of the same guys then, so I was used to the jabs. I had a lot of support from my family and friends and knew I entered because I truly believed I could win. Do you pray before the race? Yes, I pray to the spirits that my horse is safe and everyone else too. I pray to all that have gone before me to watch over and give strength. It’s just simply closing my eyes and feeling it. Deb may not jockey any longer, but she is still active with the WFSR. You will find her at the top of the hill emceeing the race prior, as it is taking place, and post. Carmen: I grew up in Minnesota where horses were farm animals used for plowing and pulling wagons at harvest. Now I live in Arizona surrounded by stables and beautiful riding animals. When I needed to write a chapter in my debut novel about my protagonist learning to ride a horse, I had to take a lesson or two. The most astounding thing I learned was how intelligent horses are. which made for a great chapter in my book. Judith, I’m certainly glad you were able to take a couple lessons and use it in your books. That is exactly what authors need to do when able. Good for you! And yes, horses are very intelligent! Wonderful interview, Carmen. 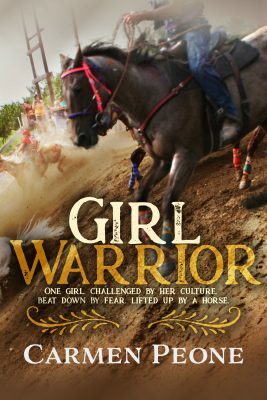 I can imagine that you gleaned lots of material for your wonderful book, Girl Warrior, from that conversation. Thank you, Mary. I really did. We talked for quite a while and our time during the eliminations was fabulous. To be there was the only way I could have written this story with such authenticity.